Photo courtesy of Steve Kaye. Found in street market in China. Mountain in background is Mt. Fuji (Japan). Someday, this art will hang in that famous museum, the Levour. I’ll skip the escargot sashimi, s’il vous plait. Now who painted over Tokyo Tower using that ghastly boring shade? Why do this? Who would go to the trouble of inserting Mt. Fuji into the background of the Eiffel Tower? It’s not as though they made a weird mistake, like the Queen bootleg album which has the Beatles on the cover – no, somebody actually had two separate pictures and decided to splice them together. Why. May i suggest the ramen croissant, Monsieur? Ever been to the PRC? I’m thinking of painting My. Rushmore. Is Uncle Sam on the right or the left? 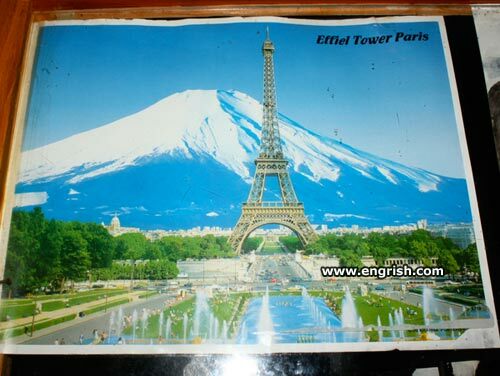 NOTE: It’s Effiel Tower, not Eiffel. All rights reserved! This is just a little in-Seine. – Sum Ting Wong, Rofl Mao? So is the Tokyo Tower in France, now? I guess next they’ll have the Empire State Building in Toronto. Talk about foreign exchange! I’ve always had a yen to see the Eiffel Tower. Also in the series, Trump Tower in Red Square. New spelling rule: I before F except after Photoshop. Perfect gift for throlling christmas. It’s a genuine Cézanne – Hasegawa Cézanne. Happy New Beer and Mary Crisp Max with French Flies! Are the Chinese implying that Japan is infested with Paris sights? No Surprise! The Chinese even built a replica of the Sphinx as a tourist attraction. Well, there was a Bugs Bunny episode where Paris was in the Alps. Japanese love hotels have a variety of oddball signs to advertise what they are, including mock Statues Of Liberty. Maybe that was one such sign for a love hotel in Japan. @ Long Tom 0919.. AH So! The tower is honourable phallic symbol? Actually: Ah so desu ka! Very crever tose devious Frogs. Marum: Other known advertisements including the Queen Mary Ship, or neon signs with twinkling stars. Just, well, whatever is blindingly obvious. Why does this remind me of Gatchaman Episode 102 . . . ? All we need now are the Galactor mechas. There is a whole set of these called “Thirty-six views of Mount Fuji” by Hakousai. This is no. 37!